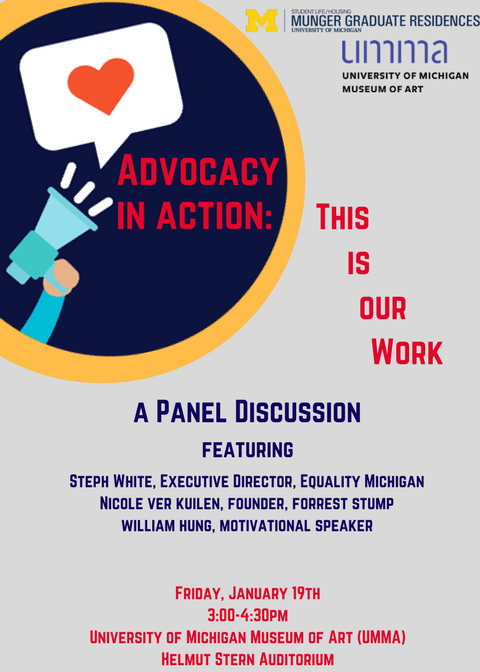 This graduate student-driven initiative invites a panel of unique voices to partake in a discussion about how advocacy shows up across disciplines. For some, advocating for marginalized groups means taking part in protests or raising awareness for a cause. For others, advocacy is their work. For all, advocacy requires patience and perseverance. Steph White: Steph White is the Executive Director for Equality Michigan and Equality Michigan Action Network. Her career spans over two decades of leading collective action from US Army Commander to Political Director for the Michigan Democratic Party and the Schauer for Governor Campaign. She then spent six years in Washington DC working on federal policy issues, including serving as the Managing Director for the National Center for Transgender Equality (NCTE). Nicole Ver Kuilen: Formerly the Assistant Director of Annual Giving & Alumni Relations at the School for Environment and Sustainability here at the University of Michigan, Nicole is the founder of the Forrest Stump organization. Nicole works to raise awareness about the barriers that limit access to prosthetic technology and advocates for legislative changes affecting health care coverage of activity-specific prosthetic devices. William Hung: Some might remember William from season three of American Idol, but few know about the controversy surrounding his fame, as both he and his fans were accused of promoting and endorsing racial stereotypes against Asians. William Hung is now a motivational speaker, working to encourage and inspire others to pursue their dreams despite criticism.